This 1907 home has been lovingly remodeled with a gorgeous cherry-wood kitchen, custom granite counters, all new kitchen appliances and amenities. The original fir floors have been restored to add charm and character to this darling home. The beds are beautiful and feature luxurious high thread-count white sheets and soft comforters. The pillows and mattresses are wonderful and will assure a perfect night's sleep. Every detail has been thought-out throughout the house. In the morning brew your cup of coffee or tea and relax at the dining room table or on the expansive deck with the lovely mountain views. Or walk down half a block to one of the lovely local coffee shops. 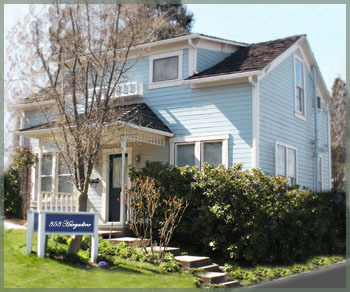 Stroll to lunch in town - you're a 1-5 minute walk away from anywhere in downtown Ashland. In the evening, two of Ashland's finest restaurants are literally steps away as are plenty of casual dining options. Park the car in your private parking space and forget about it because you can walk anywhere from this perfectly situated and wonderfully furnished charming home. The Green Show and OSF box office are two short, level blocks away. Ashland is a mecca of amazing restuarants and eateries, all within a few blocks of your stay here. Additionally, there are Coffee houses, Brew Pubs and Wine Bars all waiting to be discovered! Here are some resources to help you discover Ashland's finest! Yelp lists over 100 Restaurants! Since Oregon has no sales tax, you're already getting more than an 8 percent discount on anything you buy. Specialty shops and boutiques include bookstores, galleries and clothing stores for young hippies and old bohemians. Ashland’s beauty will first capture you with the unique geographic setting of being nestled at the base of the convergence of the Siskiyou and Cascade mountain ranges at nearly 2,000 feet in elevation. Yes, we Ski here too!